Often when one thinks of restaurants in Austin, Texas, Siena Ristorante Toscana is not likely to be at the forefront of what comes to mind. This romantic Italian restaurant sits on the quieter side of the city behind a strip off of 360 and RM 2222 along the rolling hills. This is a place I would likely bring my husband to on a date night (if he were here in Austin). Since it was just myself, I decided to visit on the lunch hour. I ordered the lunch special of the day which was a redfish with eggplant caponata. 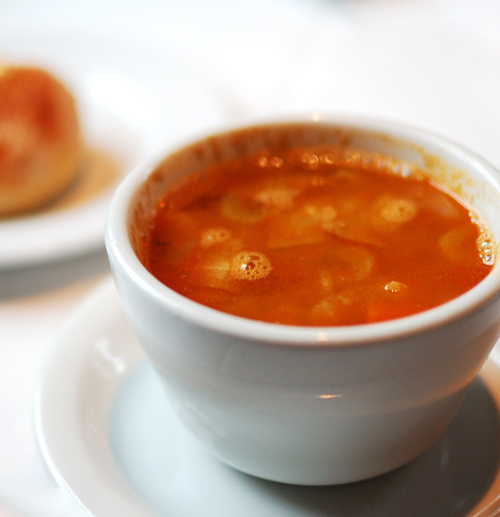 The dish came with asiago bread and a side of their soup of the day, lentil soup. The lentil soup came out first and I found it very comforting on this particular rainy day. The taste was rich, yet humble– slightly reminiscent of my own mother's vegetable soup. The soup was loaded with celery, potatoes, tomatoes, cabbage, and of course lentils. I found it to my preference, which is on the lighter side and not very salty. Out of eagerness, I did burn my tongue a bit drinking it too fast, but I wasn't regretful. The redfish topped with eggplant caponata was accompanied by brussels sprouts and roasted potatoes. As a fish lover, I am very happy my server recommended this beautiful dish over my initial plan of ordering a pasta. The redfish was moist and tender, just slightly crispy on top. And the caponata went extremely well with the mild taste of the redfish. It was delicious, consisting of tangy, salty, and sweet flavors. Each bite was a lovely mixture of textures: the flakiness of the fish, the crunch of the caponata. I enjoyed the brussels sprouts and potatoes as well, but as expected the redfish was by far the most memorable. If not for the fact that I needed to rush to a 1pm meeting, I most likely would have stayed for dessert (my favorite course) and probably enjoyed a glass of wine. If you are looking for change in pace in the Austin food scene, Siena is a wonderful candidate if you're craving upscale Italian and or wine. Come here with a significant other or just friends on the happy hour!